Score one for Nassau County and for Valley Stream State Park as one of the sought after warbler of the migration season was found there. 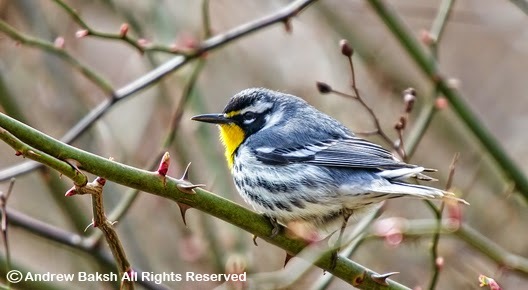 Photos of a Yellow-throated Warbler were apparently posted to Facebook on 3-30 and our very own Big Year Dude, Anthony Collerton, a keen birder with a good sense of responsibility, ensured that the wider audience heard of it by posting the sighting to the NY listserv. I will have more to say on this ! @#$@#% FB phenomenon in another post. Today, Robert Proniewych (try pronouncing that) refound the bird and called me to put out a post. Alas, I shirked my posting duties in lieu of work and so picked up his message only after he got around to posting it himself. Moments later I had an opportunity to try for it as I was on my way out, so I grabbed camera, bins and headed over. It was a short ride and during that time, another birder, Ed Becher, generously offered to stick around to keep an eye on the bird for me. I did not have to worry too much because as soon as I arrived and walked over to the stream where Ed, Bob Anderson and Stanley (don't know his last name) were looking at the bird, I could hear the chip note. Within minutes I was on the bird and after those guys departed, I helped other arriving birders to get on it. As far as I know, this is the first reported Yellow-throated Warbler in 2015 for the state and possibly for the tri-state area as I have not seen any sightings posted on our neighbors listservs. (Update @ 20:03 - Dawn Hannay, shared that one was reported from Cape May NJ on 3-26--NJ got theirs earlier than us). I could not resist, so I went in search of reported records in eBird. If my query is right, it looks as if this March sighting is the earliest report for the state (Thanks to Willie Danna who brought this to my attention -- the earliest record to date is March 26th at Forest Lawn Cemetry. A bird, found by Richard Salembier) This then is the earliest for region 10-- maybe the 2nd earliest for the state (?) This bird showed "yellow" in the lores which would seem to qualify it as (Dendroica dominica); however, there is so much variation that I am hesitant to outright say this. 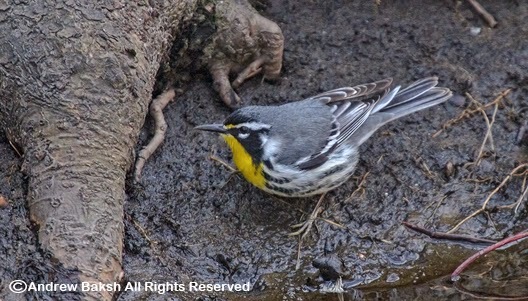 Check out the short billed (D. d. albilora) white lored type I photographed at Alley Pond Park in 2012. 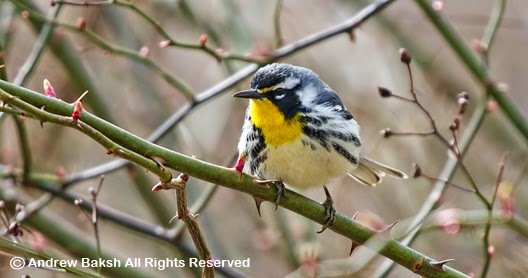 Research into the genetics and morphology of Yellow-throated Warbler is still sorting this subspecies thing out. To get those starving for Warblers motivated, I have provided a few photos taken today. Now get out there and find your own good birds! A few of my friends who I won't name, very likely cringed when they read or got word that Angus Wilson and I got exceptionally good looks at the continuing rare and elusive Mew Gull in Brooklyn on Sunday March 22nd. 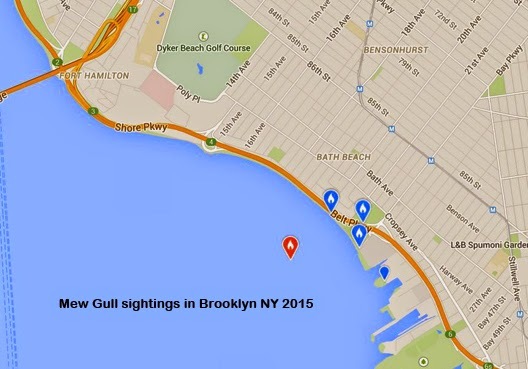 One friend who was supposed to be in Brooklyn looking for this Gull must have been especially stung. Ironically, I only ventured to Brooklyn to help him find this bird and he never even showed up. I hope he enjoys the photos--in the words of Captain Haddock "Blistering blundering bird-brain!" I empathize though, as many birders are not keen to putting in hours of wait and watch only to leave empty handed. It is a tough game this birding thing of ours. No doubt, Larophiles are a special lot but a rarity like this, I thought would be sure to bring out the listers or twitchers. So what gives? Several theories are in play here including accessibility, patience, time etc. 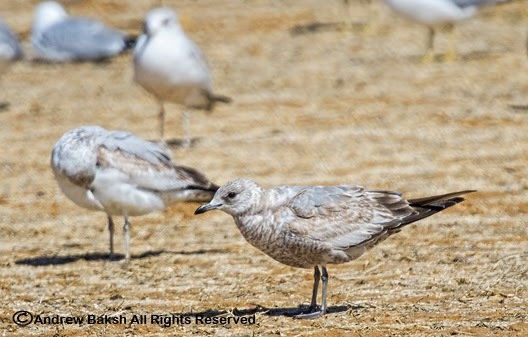 The two that that I am leaning towards are: It could be, not a lot of people are that interested in a rare subspecies of Gull or people are showing up and searching but not finding this bird. To test the latter theory, I did another query in eBird, this time using a parameter other than "Mew Gull." This time, I found a total of 61 checklists for the area, with 31 of them being unique. 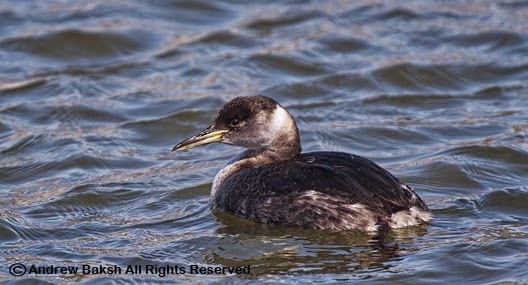 Doing additional data mining, I realized there were quite a few people who had "probably" tried to find this bird and did not report seeing it. 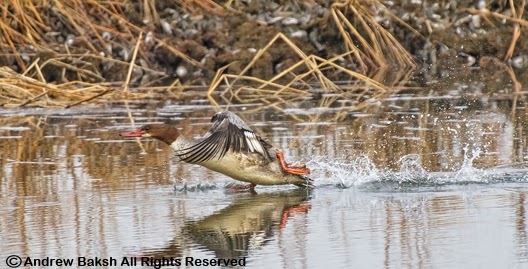 Giving credit to their honesty, this shows how difficult and elusive this bird has been for many. But wait, there is more--at least that is how it appears. These numbers seem to indicate something else as well. I was expecting many more names of people that I am familiar with to be listed in my query. Trying to keep an open mind, I factored in that eBird, is not the end all for many birders who either continue to use Avisys or some other method of keeping track of what they saw. Additionally, I am sure some people who may have tried unsuccessfully, decided it was not worth the time or effort for a checklist. Even after taking all of that into account, I was still very surprised at the low numbers. I am left to thinking that Gulls are just not attractive for many birders--even photographers. Especially, if there is a certain degree of difficulty in finding the target. Am I being too hard? Okay how about this reason. Perhaps, it all has to do with the rate of return. 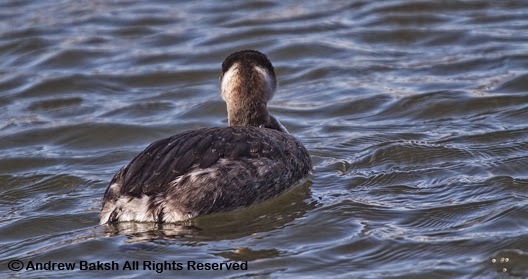 This bird has been a rather difficult subject to find and some people have expressed their frustration to me privately. Not many people want to walk miles along Shore Pkwy or stand around for hours without anything to show for it. There are those birds who make you work for them; this happens to be one of them. If you want to see this bird, you are going to have to be willing to put in the time and be prepared to be disappointed more than once but keep trying; with a little luck, you might see it. Just don't forget to report it. I want to be proven wrong that there are more fans of Gulls than the data seems to suggest. You won't find this in The Kingbird (a New York State Avian Records Committee Publication). It is certainly not an extraordinary feat by any means when it comes to records in the city and overwintering birds. However, it is a significant record for my backyard and on a personal level a most satisfying achievement that I was able to keep two Baltimore Orioles happy through this winter of 2015. These birds should have been overwintering somewhere in Central or South America but they chose my backyard for what turned out to be a tough winter. 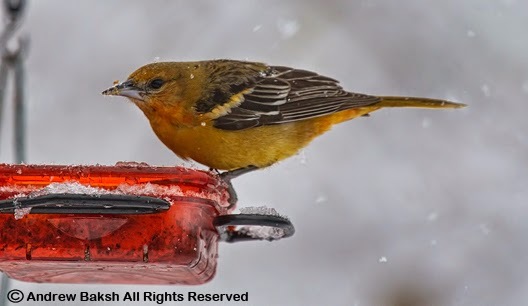 The first Baltimore Oriole showed up on December 31st 2014 and the second bird showed on January 6th 2015, although I suspect it might have been there as early as the 4th since on that day I noticed a brighter bird and wondered if it was a different BAOR. These two birds were not like my usual wintering backyard visitors like the expected White-throated Sparrows. They were royalty, deserving the type of high maintenance treatment for those special guests. And they certainly got that, keeping me on a tight schedule. Always ensuring that I kept their feeder well stocked with fruits and live meal worms. It got to the point where they would chastise (chatter at me) me if I was late in refilling their feeder and I rather enjoy them flying right in and standing over my head whilst I refilled theirs and other feeders. The backyard birds for me hold a very special place as it was those visitors that rekindled a love for birds that was always there since my childhood. Keeping those feeders well stocked, the bird bath clean all through winter requires commitment and well lets face it -- money (sacrificing those eat out joints helped). It is rewarding though when you have birds like Icterus galbula at the feeders on a day when it is snowing. 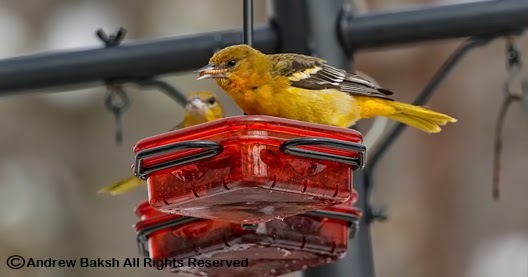 How many people in NYC could boast that they enjoyed Baltimore Orioles all winter at their feeders? I bet not many. So, indulge me as I share or brag about these two fine birds who are still here but at some point will depart, no doubt leaving me a bit sad but happy that I was able to give something back to the birds that bring me such joy. My friend Sandra Paci, teased me that I have spoiled these two Baltimore Orioles but they won't forget my kindness. I hope she is right because I won't forget them either. On March 10th, Baisley Pond in Queens NY, produced the 5th banded Ring-billed Gull I have found there this winter. 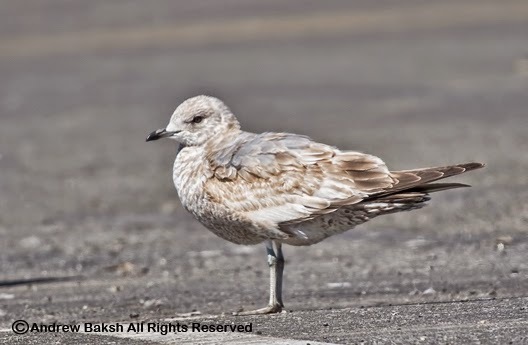 As I have done in the past, this bird was reported to the banding station in Quebec Canada where there is an ongoing research program on the ecology of Ring-billed Gulls. 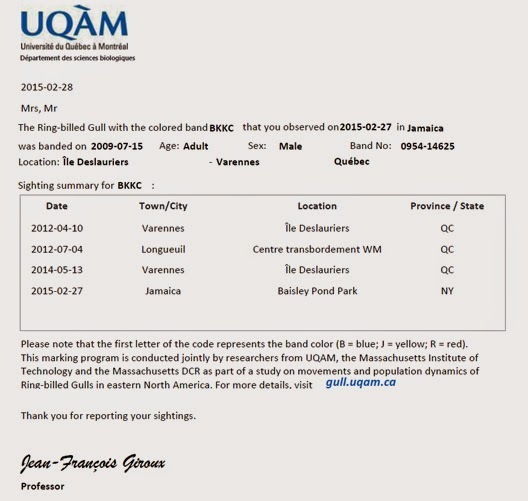 Within a matter of hours, I received word from Professor Jean - Francois Giroux who sent me information about the bird, which was both banded in Quebec, Canada. My report, is the first entry in the re-sighting summary. 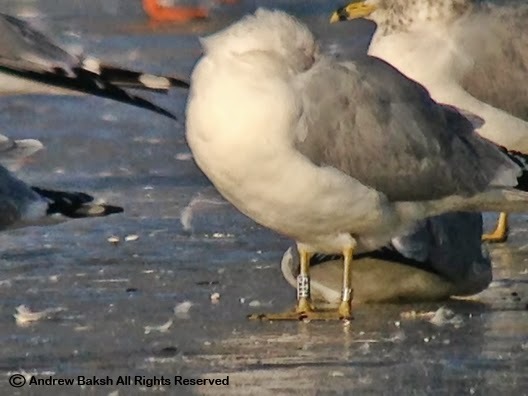 I was really lucky to spot this banded RBGU in the flock of Gulls at Baisley Pond. It was tucked away in the middle and I had to zoom in with my scope to the max along with my iPhone to get anything that I could read. This was the only shot I managed before the birds reshuffled and I could not pick it up in the flock thereafter. I hope to find and report more banded RBGUs to aid Professor Giroux and other researchers. 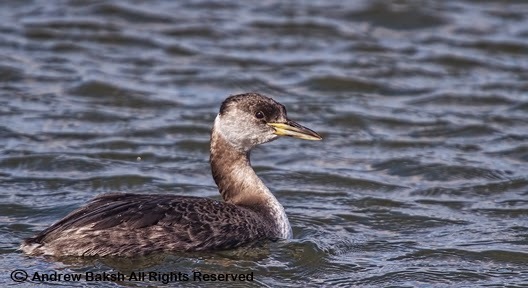 Keep your eyes on the lookout for banded birds when out there. Call it whatever you want. Me, I believe in consequences for one's actions or in-actions, so when I found a Black-headed Gull on March 1st, at Fort Tilden in Queens NY, I chalked it up to Karma for the kindness I had shown an injured Harbor Seal observed at Jacob Riis Park, a location also in Queens. If you follow me on twitter, you might have caught that I tweeted an SOS regarding an injured Harbor Seal that was observed the day before, February 28th, at Jacob Riis Park. It was late afternoon but I did some research in the field and found information for Riverhead Foundation an organization dedicated to rescuing, rehabbing, researching and educating of marine life. They run a 24 hour operation and I was able to get someone on the phone sometime around 5:30 p.m. After sending them photos and having a couple of conversations, they decided that they would wait until the next day to see if the Seal needed help. I assumed they knew what they were doing but being naive in not knowing how badly this Seal was hurt, I was of course quite worried. I volunteered to check up on the Seal the next day, which meant putting off other birding plans. Who wouldn't? There was no way I could not have checked back in to see how the Seal had fared the night. The morning of March 1st, saw me back at Riis Park. The Seal had made it through the night and its injuries did not seem so bad after taking a look. Again, I was engaged in exchanging e-mails, photos and even video with the Riverhead Foundation. In the end, (making a long story short) the Seal made its way back into the water and I watched it swimming quite comfortably. Leaving Riis Park, I decided that since I was near Fort Tilden, I would pop in and bird the oceanside. Would you know that while I was there, a Black-headed Gull flew in off the ocean and dropped onto the beach right in front of me. Yeah, so it is not an Ivory Gull but what the heck, I was quite happy with a Black-headed Gull. That my dear readers, I am taking to be Karma -- I was not expecting anything in return for my earlier actions. If I had not returned to checkup on an injured Harbor Seal, I would not have been at Fort Tilden and thus not seen a BHGU, which happened to be the 1st one of the year for me and very possibly the only one I might connect with since they are uncommon to rare in the area. That's my story and I am sticking to it! 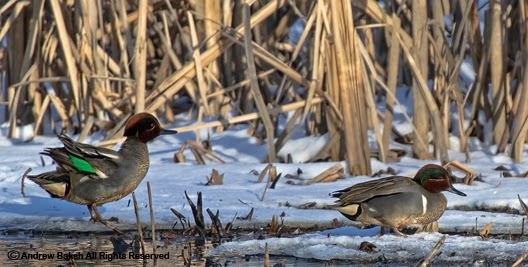 I was lucky on February 18th to find a Common Teal which is the Eurasian form of Green-winged Teal. It was the second time in two years I found one at Brookville Park in southeast Queens NY. This was even an earlier date than last years find, which was on March 1st. You can find last year's post here which details some of the nuances in separating Eurasian from American Green-winged Teal. Below are a couple of photos showing both forms. Drake Eurasian Green-winged Teal on the left with 1 drake and 2 hen American Green-winged Teals on the right. Drake Eurasian Green-winged Teal on the left with drake American Green-winged Teal on the right. Note the horizontal vs vertical stripe. 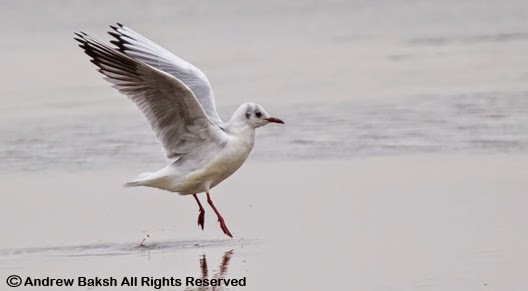 On February 27th, I observed and documented two banded Ring-billed Gulls at Baisley Pond Park in Queens. 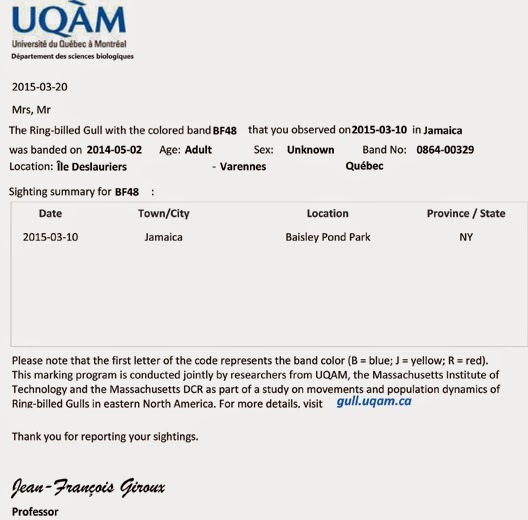 That same evening I reported the information to the banding station in Quebec Canada where there is an ongoing research program on the ecology of Ring-billed Gulls. 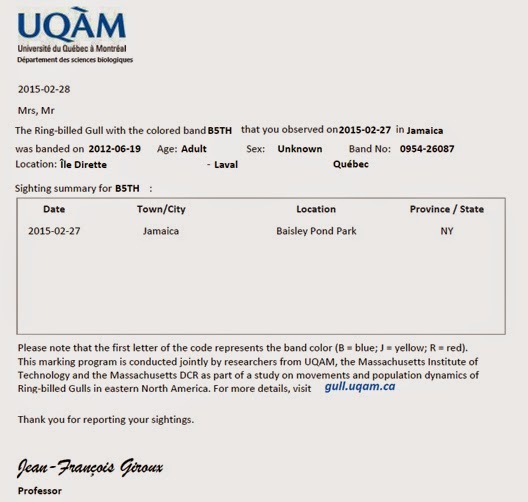 The next day, I received word from Professor Jean - Francois Giroux who sent me information about both birds, which were both banded in Quebec, Canada. The photos I got are not the greatest quality as I digiscoped both subjects at a fair distance. However, the photos were able to aid in verifying the codes. 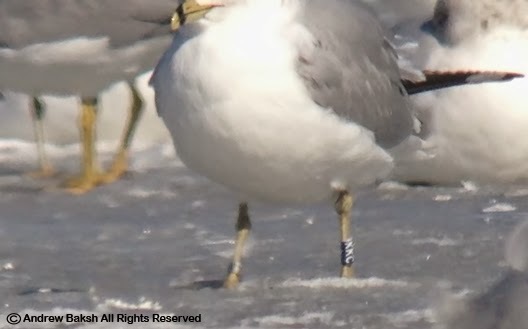 This bird with band code BKKC shows 3 entries in Quebec and my report was the first US entry in the summary of re-sightings. 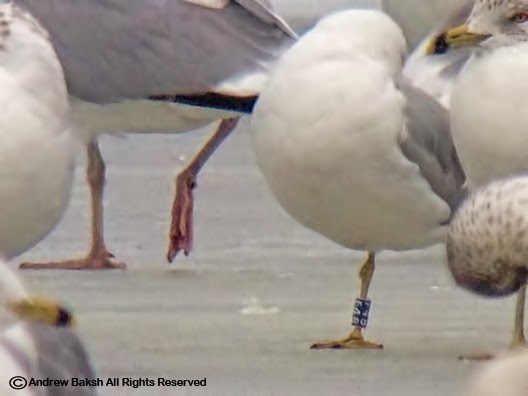 The second banded RBGU was banded in 2009. My report will be the first re-sighting entry for B5TH. As I have noted in previous reports of banded birds, documenting such data is very important to researchers who are then are able to map out the movement of these individuals as well as flocks they might be roving with.